Enquiries: ROBERT MOORE - Register Co-Ordinator, Phone: (02) 6845-3279, Mob: 0458 453 279. Remember..... we are both workers, so the answering machine will take your call, and we will get back to you A.S.A.P. The enthusiasts, who pay an annual fee to the Register, are responsible for keeping this website and the Register operating. There are currently just on 100 members, Australia / World wide, in the Register, as at July 2018. We appreciate your valued assistance and your co-operation. Wishing all... good times and fortunes with your projects. Robert and Anne Moore, Co-Ordinators. There is a lot of mis-information out there regarding Howard Machinery. With the assistance of Howard Family members, ex-employees and some former Dealership employees, the Register has been able to source much material and expertise. Serial Numbers and dating are known to only but a few and they do their best to assist one and all. The Register is grateful to these people, and we trust you are satisfied with what we are able to do. Please help us to help you by supporting the Register. INFORMATION IS PRECIOUS. So if you have a problem, just pick up the phone and I can honestly say "I will do my best". Robert. HAVING PROBLEMS WITH A MACHINE? These people have offered their services to assist you with your project, and are on your Howard Register lists. Please check before contacting us. Junior Owners. Please read Article # 2, located on the "Restoration Articles" Page, refering to the Oil Flow / Blockages situation regarding these and any machine. A lot of effort went into this Article. Makes excellent reading. Would the enthusiast, who passed onto me a compilation of HOWARD 2000 Serial Numbers and Dates, please contact me as an incident has arisen, where half the numbers have gone missing. Thank you, Robert. Kelpie Dozer Blade with Serial No: 016/019 on it. There is a Booklet doing the rounds called "Rotavators". Modern Means of Increasing Income. This booklet is not the original as published by Howard Rotavators, Northmead. The booklet is an altered reprint by E. Hassett & Sons, who include their print. If you look through the booklet, you will note that the front and rear covers show the DH22 TUG. The pages are only partially numbered. In the original, pages 17-19 are regarding the DH22 4WD Tractor and include a picture of said machine. If you want the missing pages as a supplement, I can provide them. Robert. Matthew Vella - 0418 438 442 (after 7:30pm weekdays), is organising a Howard Shirt for displays, etc. 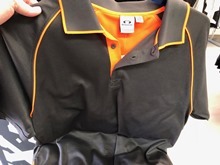 The shirt is cotton lined inside, being polyester outside, so it breathes, keeping sweating down. Colour is grey with orange pinstripe borders. IT HAS A POCKET. Logo - small on front, large on back. Cost is $53.00 each. Compare this to my Register Shirt (black), which cost $45.00, way back in 2005, and it only has a small logo on the front and my name. Matthew is covering all up front costs, so get in and support him. Will be great to see one and all wearing the same shirt at our Gatherings. ORDER YOURS NOW!! Well folks - it's finally here! 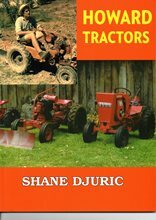 Howard Register Member, Shane Duric's - HOWARD TRACTORS Book. but the Howard Family and former Employees. The price is reasonable and any mistakes were caused by the Publisher - not the Author, Shane. So enjoy your reading because there are still machines out there to find. 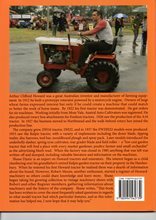 You can contact Shane on 0400 266 707 to order your copy. Howard Register Items in Stock - in Consultation with the former Howard Australia. 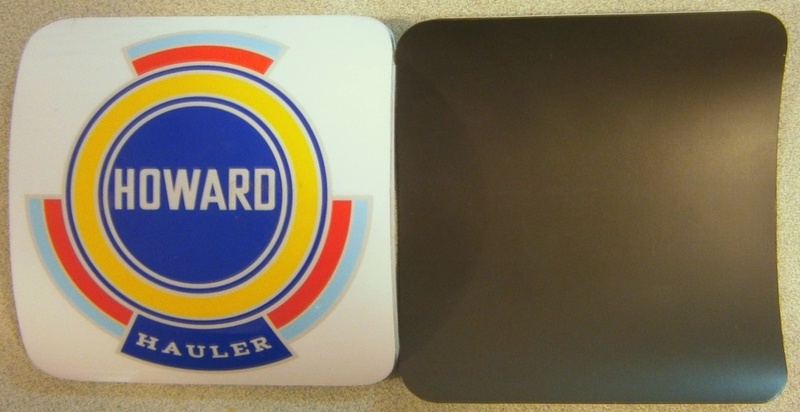 HOWARD LAPEL BADGES (Actual Size) - $7.50 posted. HOWARD HAULER Owners. Transfers or Magnets for your machine bonnets are now available. Each are $15.00 - Posted. Ring Robert Moore - (02)6845-3279. BANTAM STICKERS available for $10.50 - Posted. If you click on the picture you will see a larger version, which is almost the exact size of the sticker. The Signwriter has made five (5) more of these, that are uncut, You have to edge cut them yourself. 1945 HOWARD GENERATING SETS P.E. 5KVA, 240 VOLT, 50 CYCLE A.C. (Aust), No.1 MK 1. "V" Twin Engine. (See "Article Three" of - RESTORATIONS / ARTICLES Section). 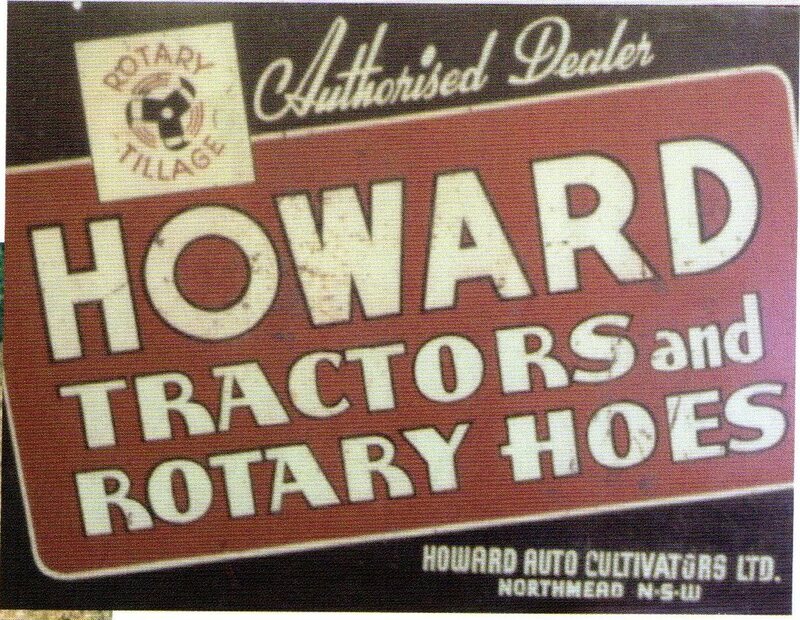 Sales Brochure, put out by E Hassett & Sons, Howard distributors in Melbourne, regarding implements, other than the Rotary Hoe, for DH22's. Cost $4.50 to cover copying, & postage. We have a large range of GENUINE MANUALS in stock. Photocopies are available upon request. MAGNETO COUPLING - Just landed from New Zealand. 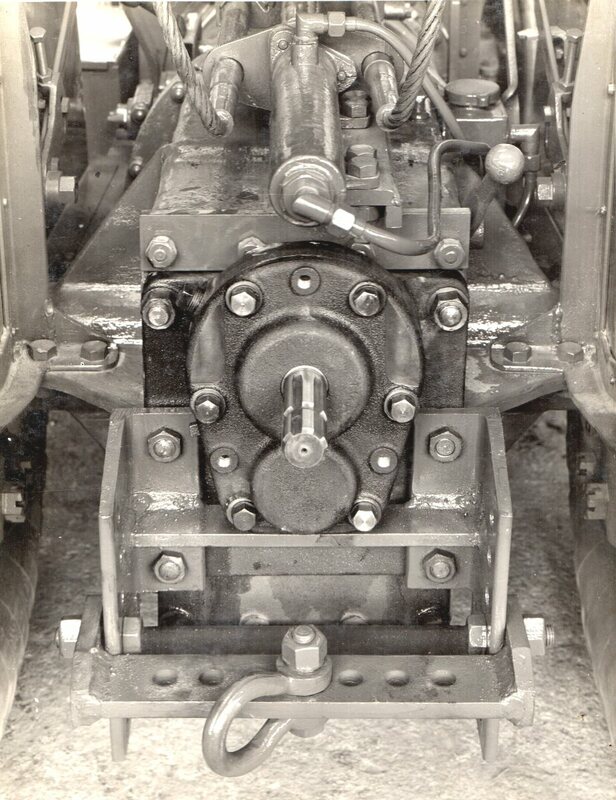 19/20 tooth Vernier drive coupling. $45.00 + Postage. Limited number! The 19/20 tooth, rubber magneto sprocket, is readily available in a strange area. GASKETS - GASKETS - GASKETS - Need a GASKET? Contact: Craig or Ron Swanson of SWANSONS GASKETS P/L. in HORNSBY NSW. Phone - (02) 9477-2427, Fax - (02) 9477-2756. Get a quote from them before going elsewhere. You will be surprised. NOTE - New old stock Gaskets may contain asbestos. Not only are these not permitted to be sold, but the asbestos goes hard and cannot be compressed under 80psi and may possibly fail, caused by cracking etc. BEARINGS & SEALS. Always talk to your nearest supplier and take time, as a few people have been able to source items they thought or were told don't exist. There is always an alternative. Think Plumbing and Brake parts suppliers too, especially for leather seals. GEARS - WORM DRIVES - CLUTCHES. K.J.& L.M. HILL, 85 Arcadia Road, Arcadia NSW were the contracted Suppliers to Howard Australia. They also may have engine components for Gem, 350, 352, Terrier, Bullfinch, Foxie and Kohler. They are winding back their Business, regarding retirement. Phone: 02 9653-2054, Fax: 02 9653-1969. GEARS - is able to organise gears to be cut. He is currently, also looking at TERRIER, but will look at any gear. Can also supply KELPIE Decals. Peter has been able to source a supply of KELPIE front Wheels. He is now making DH22 Radiator Caps. Pete seems to be into everything. Give him a ring for details. Howard 2000 Owners - 590 x 15 Tyres are available in metric equivalent as: 6.5 - 80.15 (6 ply). 750 x 16 Jeep replica tyres were also fitted to these machines (not all). Have been sourced at TYRE RIGHT or your nearest agricultural tyre supplier. HOWARD 2000 RIMS - Early Volkswagen or F J Holden is exact same rim, just cut out centres. GOLD STAR TYRE and BATTERIES at Balhannah S.A. (08) 8388-4176, have Howard 2000 Tyres - BKT R1 6.5/80-15. GEM - 20 x 12 x 2 PLY is the known standard tyre as per the Manual. But in today's world you can find 4.00 x 12 x 2 PLY, Agricultural "V" Lugged, for around $90.00 without tubes from Tyre Right. If you need tubes, ask for the correct valve stem, or a brass 90 degree screw on fitting. It swivels. Any Bigger tyres will more than likely not fit onto the machine. DH22 & 226 - Jeep relica tyres are available at nearly half the price - 600 x 16. I have known Steve Plemming for some time and his Edge Machining Co. If you need Pistons - Rings - Engine Rebuilding or White Metalling, give him a ring. He is also a Howard enthusiast. Phone: 03 5828-6250. Steve also does general engineering work. I also understand he has a supplier for gaskets. ROBERT MOORE has a heap of BRIGGS & STRATTON parts to suit 3Hp up to 12Hp / 13Hp. Robert also has a limited amount of KOHLER & WISCONSIN parts -- including rings, pistons, air filters and gaskets. Before ringing, it would be easier, if you have the correct Part Numbers. LISTS can be Mailed out at $3.00 each. Covers Postage & printing. Received confirmation of a company in America regarding engine components for Briggs & Stratton, Kohler, Tecumseh, etc. *** Prices may vary due to fluctuation of the Australian Dollar. 12 Volt STARTER / GENERATOR for Briggs & Stratton motors. Contact your Rural or Country Fire Service, as they have stocks of these for fire units. I discovered this when putting together a trailered RFS pump for a village, when we fitted the engine. AUTO CARBS AUTOMOTIVE - Throttle Shaft repairs, re-bush Carbies. 103 Norman Street, EAST BRISBANE, QLD. (07)3391-2433. PERFORMANCE IGNITION SERVICES - Service most ignitions catering for Vintage units and the like. Spark Plug lead components. Nunawading, Victoria. (03) 9872-3644. DH22 RESTORERS - TAKE NOTE!! Holden - grey engine rear main seal is an exact fit for your engine. I GET A LOT OF ENQUIRIES ABOUT DH22 ENGINE NUMBERS. WHEN SITTING ON MACHINE SERIAL NUMBER IS ON L/H/S OF ENGINE BLOCK, AT BASE OF CYLINDERS. A 1" OR MORE, MACHINED SPACE IS EASILY SEEN ON EDGE OF TOP SECTION AT BASE OF CYLINDERS OF BLOCK. THE SAME CAN BE SAID OF SOME 226 MODELS AS WELL. WALK-BEHIND MACHINES S/No. IS USUALLY ON TOP BAR/S. I have been informed that http://www.mdr.co.uk/tillerparts/tillerparts2.html is a good site in locating Rotary Hoe parts from the U.K. PAINT - Matching this paint is a little difficult, due to cessation of Lead content. There were possibly 4 shades by various Companies. A brownish Orange can be sourced. Use wet chips of paint. Some Retailers still have old LEAD contents. Ask them. Stop enamel fading - add hardener from 2 pack. Want a polish for your brass, copper or aluminium that works beyond belief? AUTOSOL Metal Polish in a 75mm tube. The tube itself is black and gold with white lettering - Autosol - on a burgundy/orange background, and - Metal Polish - in white, in a black background, with white, black and gold stripes. INFO - I have just had the experience of repairing the steering on my Kelpie. The front pins on the bar were worn, as were the holes. Instead of replacing pins and building up holes, I used COPPER pipe and now have no play. I 'don't work the Kelpie so should last a long time. BRASS would be better. HEAPS OF DH22 PARTS, INCLUDING TRACTORS AND ROTARY HOES. HAS BEEN OFFERED $200.00	/ TONNE, FOR SCRAP. LOCATED - MARYBOROUGH IN QUEENSLAND. RECKONS MORE THAN A SEMI LOAD. Howard JUNIOR - ROTARY HOE BLADES .....$10.00 each + Postage. Howard JUNIOR - BARREL .....$25.00 + Postage. Howard JUNIOR - VARIOUS PARTS. Not a lot. - Air Filters; Gears; Covers; Reverse Gear Jack Shaft with 3 Sprockets. OPEN TO OFFERS ON ALL ITEMS. PICK UP ONLY. carby bits, carbys, gaskets, coils, rings, pistons, conrods. ** HOWARD Rotary Hoe 20" cut, Single Cylinder with Reverse, (Clutch Problem) - $200.00 in a shed. FOR SALE - DH226 Tractor. Good for spares or long term restoration. Motor seized, badly rusted. DH22 ORCHARD MODEL, Serial No: 645. Blue in colour. 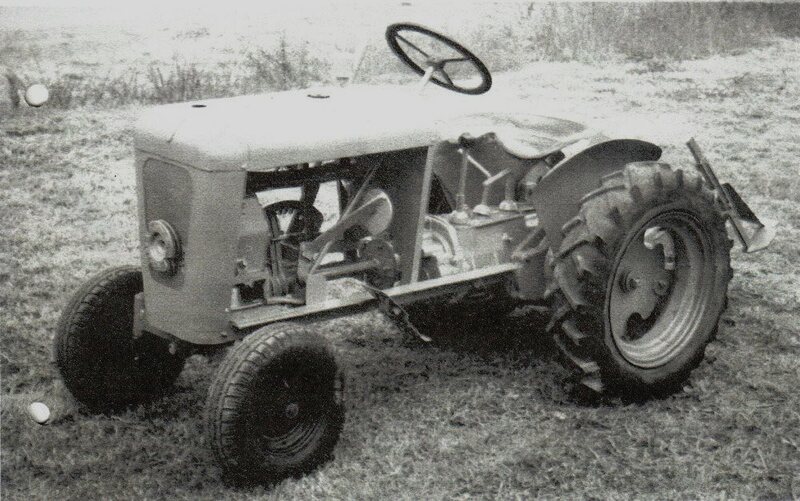 Howard 2000 Tractor, Serial No: 40676. No Implements. Howard Twelve, Serial No: 6173. Maggie coupling needed. Cut out switch. Howard Junior, Serial No: 29271, Reverse Gear. Ignition cut out switch. $2500.00 THE LOT. Ring BOB - 0448 877 775, Central Victoria. FOR SALE - Howard JUNIOR - not going. Collection of ROTARY HOES $770.00 - hoes, + KELPIES. Graham Hosford of the Central Coast NSW, offers For Sale his Collection of Rotary Hoes including BANTAM, BULLFINCH etc., due to ill health. Ring - (02)4368-1580. IF YOU DISCOVER AN ITEM HAS BEEN SOLD, PLEASE LET ME KNOW. Does anybody know the location of a HOWARD COLLECTION, sitting in the hills, between MENDOORAN and COONABARABRAN, NSW and the backroad between these two towns??? I have been told by two people, but they cannot pinpoint the location. Not able to be seen from the road. WANTED - HOWARD 2000 BRIGGS STARTER GENERATOR. I want to see if we can start an Exchange Program, Robert. No need to be running. I am setting up a static display of Howard Engines. - Robert, 02 6845-3279. HAVE YOU SEEN THIS MACHINE ??? Ring: Robert Moore on (02) 6845-3279. The one item I do not have in my collection to display is a genuine early HOWARD sign - as shown. With the closure of Howard Australia, the dealerships will have signs and flags. Please ask the dealerships for a sale price, or obtain them for free. Gear driven PTO off the rear of a DH22. This is the third and last PTO made by Howard Australia. It was made so as the DH22 could be more utilised. Contact: Robert Moore on (02) 6845-3279. DH226, Shunter (Tug), 4WD DH22, Kelpie and Hauler in not too bad condition, and reasonable price. 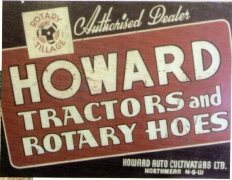 WANTED - A16 (3-wheeled) or D16 (4-wheeled), Morris powered Howard Tractors. Contact ROBERT MOORE - (02) 6845-3279, MATTHEW VELLA - 0418438442. Sickle mower for Howard 2000, and a Diesel powered 2000. Clutch assembly; bonnet & petrol tank or a complete 2000 unit. WANTED - A 6:1 In-Line reduction gear box to suit an 8HP Briggs & Stratton, on a Howard TRENCH DIGGER. WANTED - DH22 parts or whole machine. Looking for Magneto, Fuel Tank, Bonnet, Oil Cooler. I live at Maryborough in Queensland. WANTED - 1925/26 MORRIS Type 2, 4 cylinder Engine or Parts there of. Matthew - 0418438442. WANTED - BRASS CARBY, or even an alloy up-draught (brass preferred), to suit early DH22. WANTED - 24 inch Howard GEM attachments. I am looking for a Furrow Cover, Driving Belt Pulley PTO, Hilling Plough, Leaf Guards, Soil Shredder, Pick Tines. Also some Engine Parts for English Twin A, Air Filter with a Round Top, Brass Oil Cap on lower right side of Engine. Also Howard Junior Steel Wheels with ribs. I live in the USA. Ronald Schillage - rschillage60@gmail.com (1/19). IF YOU HAVE A SOURCE FOR REPAIRS, PARTS AND MAINTENANCE OF HOWARD MACHINERY, OR A SOURCE FOR PARTS, PLEASE CONTACT THE REGISTER (ROBERT), FOR LISTING ON THIS WEB-SITE - (02)6845-3279 or 0458 453 279.